A step away from the standard looking knives on the market today! 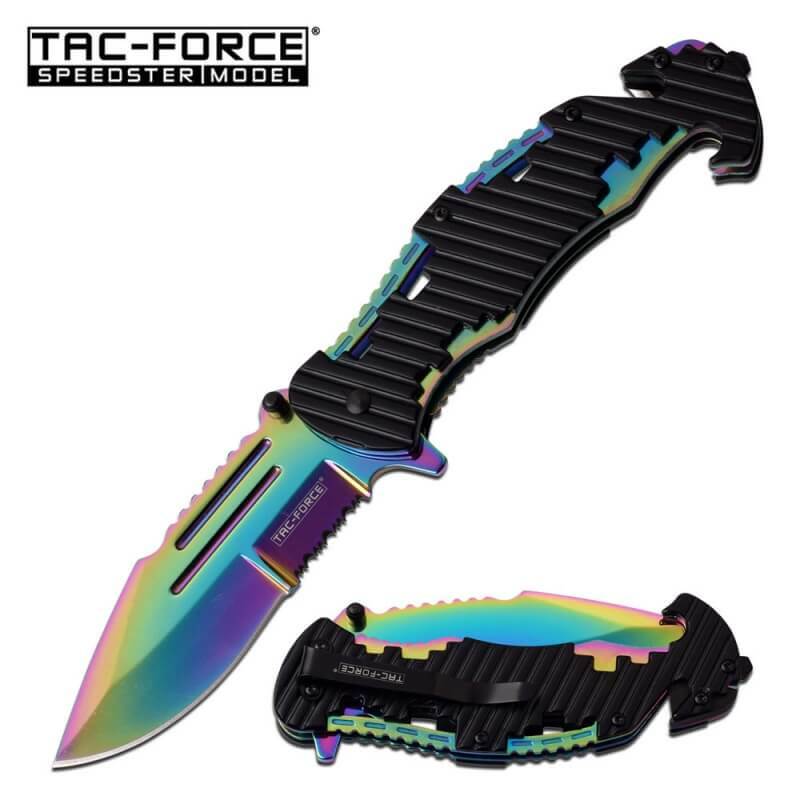 This one is striking, it features a shiny rainbow coated 3.6″ blade with interesting compound grind. A step away from the standard looking knives on the market today! This one is striking, it features a shiny rainbow coated 3.6″ blade with interesting compound grind. It comes with a clipped point and part serrated section for cutting a range of materials with ease. 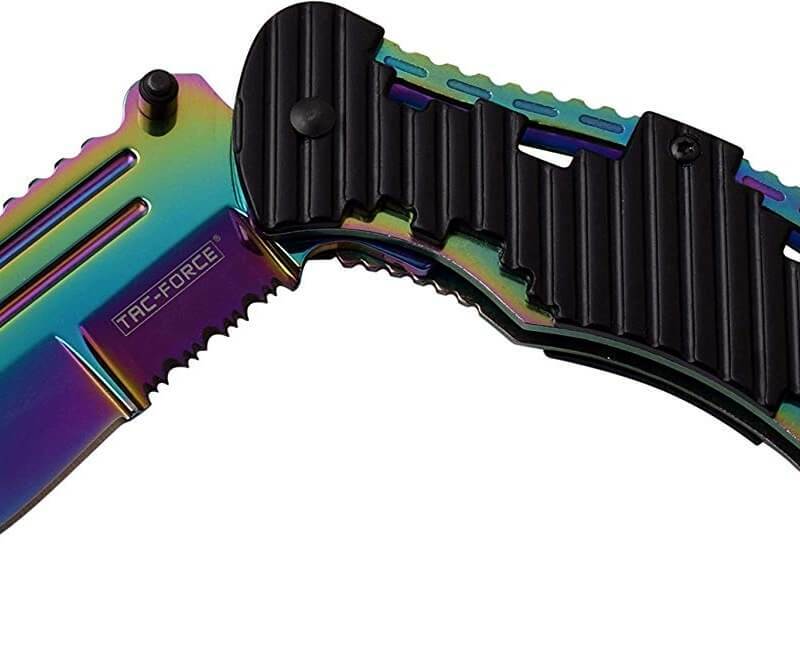 The blade folds back into a black stainless steel handle with rainbow coated liners. This knife also includes an industry standard liner lock for safety during use as well as a glass breaker and belt cutter. 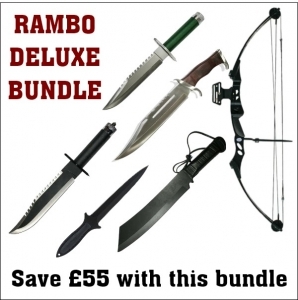 This mouth watering collection set of Rambo Movie Replica Knives includes the Rambo part I & II survival knives with hidden survival kit, compass and screwdriver hand guards, the beautiful Rambo III hardwood knife and the heavyweight Rambo IV black machete as well as the new Rambo Boot Knife. Plus the 55lb compound Rambo bow set. 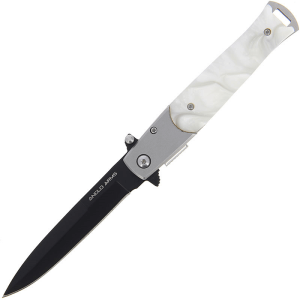 All superb quality knives made from 420J Stainless steel with leather sheaths. A lovely collection with great savings.